Active range of motion is lost — You cannot move your shoulder well. Passive range of motion is lost — Someone trying to move your arm at the shoulder joint will find it stiff and difficult to move. This condition may get worse over time. 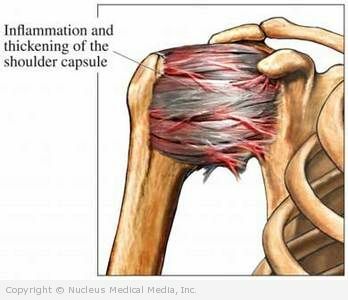 After a period of time, the shoulder may also improve spontaneously. This improvement is called thawing. Frozen shoulder is caused by tightening of the soft tissues. This includes the capsule that surrounds the joint. Closed manipulation surgery is a forceful movement of the arm at the shoulder joint. It is done to loosen the stiffness. This is performed under anesthesia. It is followed by intensive physical therapy. Be sure to follow your doctor’s instructions after surgery. In arthroscopic surgery, a small incision is made in the shoulder. Special small instruments are inserted through the incision. The tightened tissues are released. The shoulder is manipulated. Physical therapy must be done after this surgery. Be sure to follow your doctor’s instructions after surgery. Capsular distension is often done as a combination of an arthrogram and corticosteroid injection. The doctor expands the shoulder joint by injecting salt water under pressure. The fluid may contain cortisone and may also contain a dye that allows the shape and character of the shoulder joint to be seen. If you are diagnosed with a frozen shoulder, follow your doctor’s instructions. Do regular strength training and range of motion exercises. This will help maintain a strong and flexible shoulder joint. Seek prompt treatment for a shoulder injury. Do activities that use your shoulder joint regularly. After any injury to the upper extremity (eg, hand, wrist, elbow), always move the shoulder through a full range of motion several times a day. This is true even when lying in bed for an illness such as a lung infection.